Enjoy learning the history and viewing the many wonders of Cambodia with an experienced guide, fluent in English and Thai. Hi ! I am Mr. Sowanna Yun. I have been hosting guests to our country for over 10 years, and would enjoy sharing our cultural riches with you and your friends. 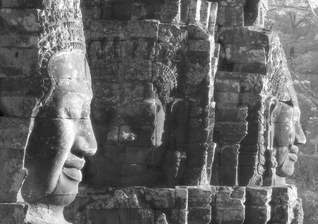 Let me begin by providing some information about our country in the "Temple" and "Cambodia" webpage selections. Welcome your call or email with questions and I am happy to assist with trip planning. I am a Cambodian who can speak three languages: Khmer, English and Thai and work as professional guide in Siem Reap - Cambodia. Special thanks to KI-MEDIA NEWS who posted my website on the information. Mr. Sowanna Yun, English and Thai speaking guide in Siem Reap - Angkor - Cambodia. 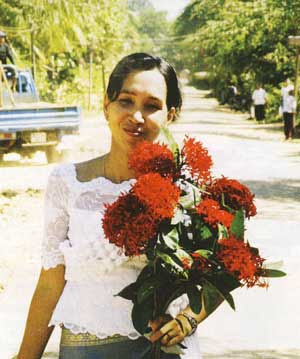 Address : H# 0241, Group 07, Chong Kao Sou village, Slar Kram Commune,Siem Reap town, Siem Reap Province. Cambodia Angkor Air.com is a joint venture between Cambodia and Vietnam Airlines.More Info. 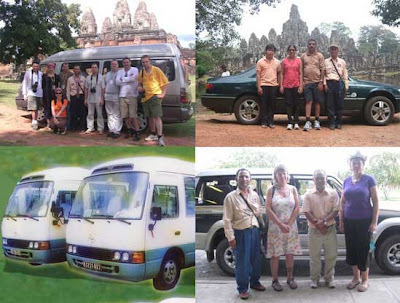 Bus travel is now the most popular means of overland transport between Phnom Penh and Siem Reap. The road (National Route #6) is paved and smooth and there are several regularly scheduled daily buses in both directions, taking only 5 or 6 hours to make the trip. Cambodia shares overland border crossings with Thailand at Poipet, Koh Kong, O'smach, Pailin, Kam Reang and Unlung Veng checkpoint. Cambodia shares an overland border crossing with Vietnam at Bavet and Moc Bai checkpoint.Cambodia shares an overland border crossing with Lao country at Voeung Kam checkpoint. and traveler cheque. Master Card and American Express are coming into wider use. Most businesses charge a 2% to 4% fee to accept credit cards. If you want to know more information from our country, Please come and pick up our services. You will not be disappointed in visiting Cambodia. More details with Sowanna Yun, an experienced guide over 10 years in history and culture. Hi. to all our friendly Readers, We are very pleased that you have taken the time to read about our private transport services. Please send me any inquiries you might have. 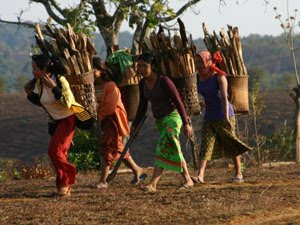 We will be only to happy to reply and give you any information on Cambodia that you require. Come and immerse yourself in the experience that is Cambodia . 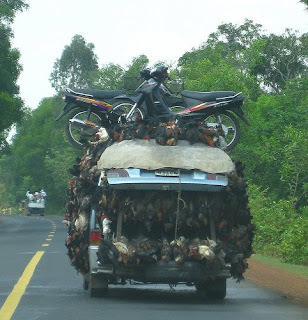 Please find A Great Deal from Cambodian Guide Services. Please Note: Taxi or moto drivers are not allowed to guide tourists in the Angkor Park. If you need a guide; these must be booked in advance as none are available within the Temples. The cost of a fully licensed guide as descriptions. We recommend that you use our quality services. No money required in advance. 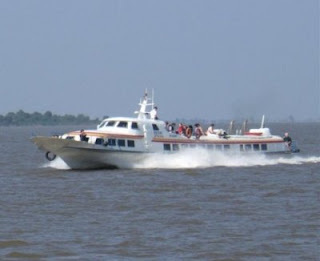 Cambodia is becoming a very popular tourist destination to avoid disappointment and delays. Book with our reliable and professional guides. If you need other languages, please send me a query. - Classical Tour Angkor Areas. Please contact us @ : sowanna012@yahoo.com . I will reply to you within 24 hours. Please give us one week notice or more than one week. We can offer you a special price. Siem Reap - Angkor has an ever-growing number of hotel and guesthouse rooms, and a variety that is wide enough satisfy all tastes and requirements. There are now several three star , four star and five star hotels in Siem Reap town, especially along the airport road and Angkor road and old market areas.Less expensive mid-range rooms with A/C, Cable TV and hot water are available in a variety of styles and looks and begins at around US$30 or US$60 but average US$60 - US$120. More expensive usually means newer, more stylish rooms and more hotel services. Budget guesthouse,usually Khmer family-run, cost US$15 - US$25 per night. Dozens of budget places are scattered across town. If you are interested in the hotels and Guesthouse, please send me a query .We are very pleased to reply to all of your Questions and Queries within 24 hours. All budgets can be caterd for. We look forward to seeing you soon. I will act as your agent in package holiday/Tours in Siem Reap - Angkor and Phnom Penh city. If you wish to , Please contact us with your requirements. 4. 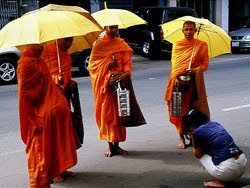 Thai Speaking GuidePlease send me any inquiries and find A Great Deal from Cambodian Guide Services. I will offer you a spcial Tour Itinerary and price. Please give me one week notice or more than one week. Less than one week I will not accept any booking. A police station is located opposite the main Entrance/Admission Station to the Angkor Archaeological National Park. Hand Phone Number: 012-402424, 012-969991, 012-838768.